I have a very dear Australian friend, a world banker, who, despite nearing his seventies, still fancies himself as a ladies’ man. I once told him that his is a ‘real gingko man’ because his nuts are small and green. I’m not sure if he got the joke. Of all the trees in our Afan woods the rarest is probable a gingko tree, which was planted by our now retired forest Mr. Matsuki and myself about sixteen years ago, before I donated the woodland to the Afan Woodland Trust. The official policy of the trust nowadays is to only plant trees which were traditionally there. However, in the old days when Mr. Matsuki and myself made all decisions, we sometimes planted different trees in order to inspire conversation and discussion. 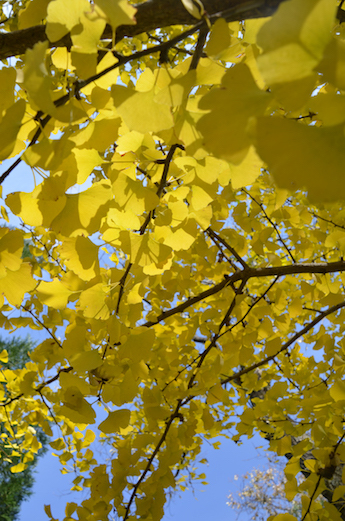 ‘Gingko balboa’ trees were first recorded by European visitors to Japan in 1690. They were common in temple gardens. 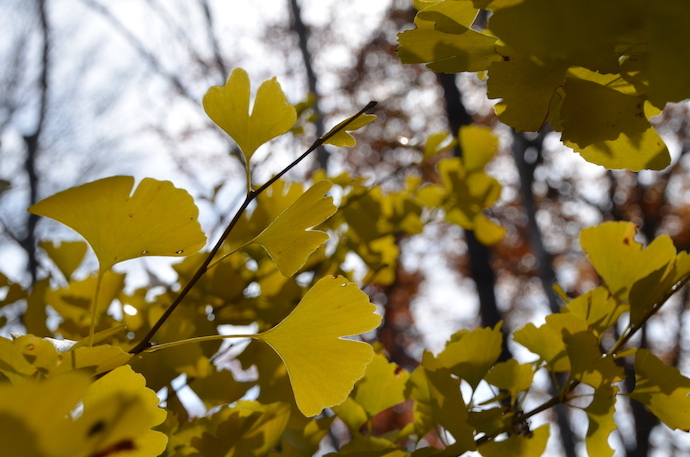 The gingko tree is probably the oldest living species of tree on our planet. Fossil records trace it back to 270 million years, so the gingko was growing when great dinosaurs roamed earth, long before man. Living gingko trees are native to China, but, as I said, were introduced to Japan hundreds of years ago. It has been cultivated in Europe for 300 years now, and in North America for over 200 years. Reaching heights of 20 to 35 metres, and being very tolerant to city pollution and restricted space, it is a very favoured ornamental tree. The gingko is of course, the symbol tree of Tokyo. The ginkgo has both male and female trees, with the mature female producing a foul-smelling fruit whose flesh can cause skin troubles in humans. However, the thin but hard shell when roasted and opened produces a small green nut, which I find quite delicious. In Japan these green nuts are commonly used in ‘chawanmushi’ dishes, but its use in other Japanese and Chinese cookery is quite common. Gingko duck foot-shaped leaves have become popular in supplement herbal medicines for treating or preventing cognitive functions such as Alzheimer’s disease and dementia. (Friends have recommended their use to me, but I forget what for) However, like so many herbal remedies, the medical profession is unsure of their effectiveness. 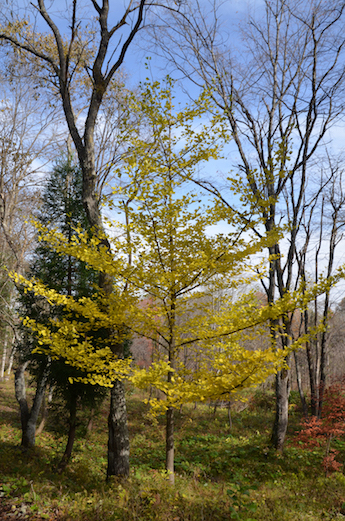 Ginkgo trees can and do live to magnificent old age, mighty, spectacular trees with glorious yellow-gold autumn foliage. One doesn’t often hear about them being cut down and used for firewood or lumber! I had to do some Internet research into the use of gingko timber and found that, especially in China, the wood is especially favoured for carving. It is apparently a hard, yellowish wood that is relatively easy to carve. I also found references to gingko wood being used for making guitar bodies, and in some places in Japan, for making lacquered rice bowls and even cutting boards. The tree that Matsuki-san and I planted is now about seven metres in height and growing well. Many years after we have both gone I imagine people walking in our Afan woods and seeing a huge gingko tree, wondering how it got there. Whatever, it has nothing to do with lecherous bankers and their little green nuts.